This riddle is one of the more famous questions that Google used to ask its Product Manager recruits. Hulk smash! Apparently is not the correct answer, needless to say, I don’t work for Google. When your organization hires for technical skills and IQ, there are a variety of ways to test software engineers, ranging from well-defined coding examples to ‘how would you write a program…?’ questions. Testing, reference checks, and user group activity can all be employed to assess an individual’s technical capabilities. What if you want to learn more about these engineers than just their technical skills? What if you are seeking people who can advance through your organization and ultimately take on formal or informal leadership roles? What if you are hiring specifically for employees that can be fast tracked to a supervisory or managerial role? What if you want a new employee to be creative to your culture, or to help change that culture in a positive manner, regardless of their position on the org chart? To find employees who contribute to the culture and morale of your company, you need to go a step beyond hiring for technical skills or IQ. You need to hire for culture. You need to hire for Emotional Intelligence, or EQ. Hiring for EQ actually means going two steps further, since EQ has been proven to be twice as important as technical skills when predicting the success of an individual employee. If you’re hiring for culture, you’re actually hiring for EQ. None of the summary-level attributes delineated above are category exclusive. 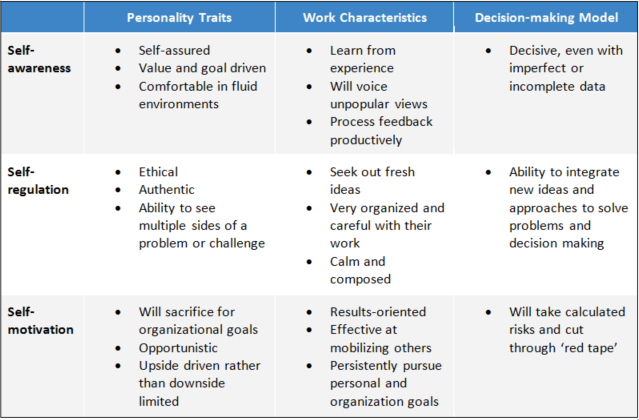 Many people with high EQs will exhibit a variety of these traits, cutting across categorical boundaries. As you would surmise, a technically competent person who also possesses a high EQ is the type of employee that gets his or her job done effectively and affectively. Grinding 60+ hours per week on code is required sometimes. It just goes with the territory. However, it’s difficult for anyone to be emotionally sympatico if you’re a workaholic. Oftentimes, it is very difficult for a person with low EQ to pivot or deviate from the normal path when presented with new or disruptive information. Many times, people possessing low EQ will be doing more talking than listening in team meetings. Any perfectionists in your organization? Many times perfectionists struggle to react to volatility in a positive manner. There is some good news here though. Whereas IQ tends to be innate, and plateaus over time, EQ can be continually improved with coaching and training. IQ Inc. possesses decades of experience in assisting its customers in sourcing and recruiting employees that possess both technical capabilities and emotional intelligence. If you’re facing this challenge today, or see it in your near future, please contact IQ for a free consultation about your needs and how IQ can help you improve your organization’s EQ.